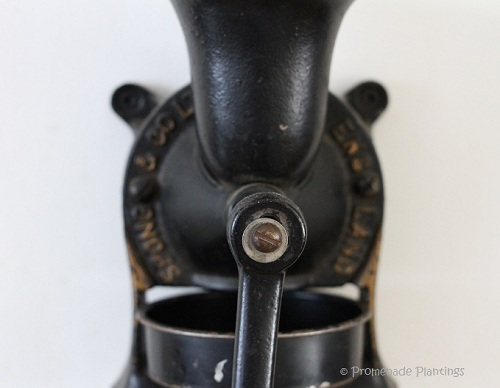 It’s ever so easy – Measure, Roast, Grind and Shake – sounds like a dance doesn’t it! The Curry dance, or maybe the Masala Dance…….. ok I’ll stop there! I love curry and I know I’m not alone, did you know that Chicken Tikka Masala is the nation’s favourite dish? Well it does depend on who you ask, but it’s definitely popular. And there’s nothing better than homemade curry, the flavours are a delight, be it warming, spicy, pungent, sour – you name it the flavour combinations are seemingly endless. In the background of great curries is a great curry powder. And we’ll be needing some homemade curry powder for the next couple of dishes that I make for me and the blogg. So what better than to make your own curry powder? The beauty of making your own is that you get to choose the proportion of ingredients – more or less cumin, a touch of fennel, you decide! A lot of preprepared curry powders are full of colourings with the bulk of the mix made up of the cheaper spices like corriander. Besides, the freshness of the powder is undoubted, think about it, how old is that jar of powder that is stuck at the back of the cupboard? And once you have made it, you will realise how easy it is and how versatile – sprinkle a bit on some fish with a squeeze of lemon before you grill or fry it, marinate some chicken or prawns, spice up some lentils or veggies . The flavours are intense and rich, subtle and well just splendid! My first ever curry powders were based on Madhur Jaffrey’s recipes, and that’s where I’ll go to for this mix, but there are so many great recipes, check out Peri’s Spice Ladle, and you’ll see what I mean! What do you need to make your own curry powder? A selection of whole dried spices, a small frying pan and a grinder or pestle and mortar. It really couldn’t be simpler ! A word about the chillies, I’ve used whole dried chillies, plural. If you aren’t a fan of hot then reduce the amount to 1 whole chilli, or if in doubt leave it out altogether; remember you can always add heat, you can’t take it away! Using a small frying pan (non-stick is good) warm it on the stove on a low heat,when warm add all the spices except the turmeric powder and gently warm the spices up. You will see the spices gradually change and darken in colour and the aroma from them will greet you as you shake the pan around and/or stir the spices around. This process takes about 5 minutes. You don’t want to burn the spices, just gently warm them through. Empty the spices into a bowl and cool for a few minutes, now put them into a spice grinder/coffee grinder or a pestle and mortar and start grinding. You may have to do this in several batches depending on how big the grinder is or how well developed your arm muscles are! You are looking to create a fine powder. When finely ground, put the mix into a clean dry jar, and add the turmeric. Put the lid on and shake it well. Label the jar and keep it, preferably, in a cool cupboard. It will keep well for months (if not longer), but ours doesn’t last that long! I think I need to ask for a small grinder for Christmas. 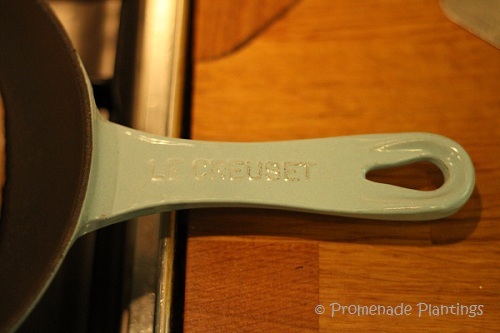 This would be wonderful to cook with. I love hot curry powder! Thank you for the recipe! Great post! We will have to do this (maybe even as a holiday gift). Thanks! I love your black grinder – it looks like its super efficient. 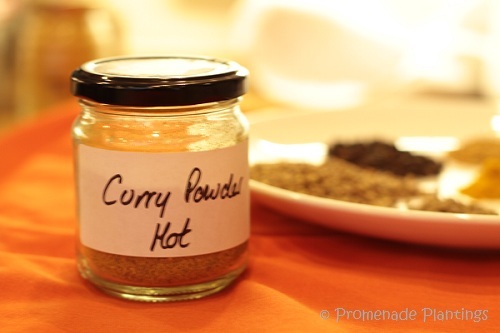 Like you Claire, I make my own curry powders…like you say, So easy and so good! Love your photos of your grinder! – and can’t wait to see what you’re cooking up for us curry-wise! The flavors of India are among my favorites! What a great idea! Thanks for the good instructions, Claire! 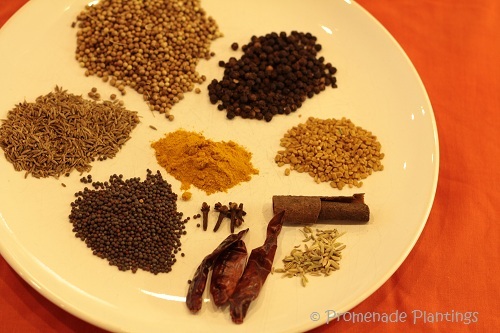 Love spices – great idea to make your own curry powder! It really is so easy, and you can adjust it so you get to try the flavours you like best! you know I love your world Uru – be it cakes and all things sweet or a bloody good indian meal 🙂 Hope you have a great weekend my friend ! We are rather the shy type of curry eaters, never too much heat is involved. I do like the idea of having enough of a curry spice blend on hand to make up dinner in a hurry. A stellar recipe Claire! I just made a new batch of Garam Masala; I’m definitely make my own curry powder next time. Isn’t Garam Masala amazing, I love adding it ! 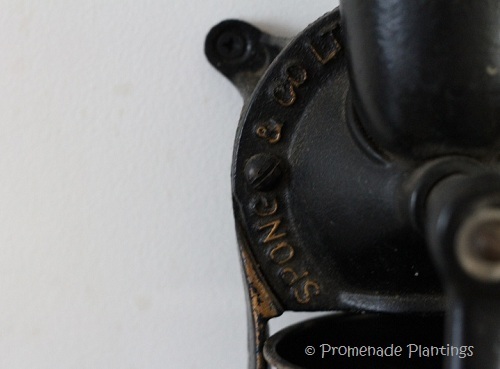 Sounds yum- can’t wait to try it… and drag out the old coffee grinder…. It’s a great use for a coffee grinder, we buy our coffee pre-ground so it never get’s used ! OMG [sorry 😉 ! ], but I don’t know where my copy of the lady’s book is and yes, thank you for the recipe: I normally start all my curries from scratch, but it will be delightful again to have a readymade mix to use in a hurry! Mortar and pestle: here I come 🙂 ! I love her book, World Vegetarian, so many great recipe ideas. What a great idea! It would definitely save on space from all the different jars. And soon, my friend, soon !! I love the smell as you grind the spices !! THis is just great! I’m really delighted to give this a try! I love a good curry powder but never thought about fillers or inferior ingredients. You add chilies…do you have favorites? To be honest Debra I just used shop bought red dried chillies…… the homegrown ones are frozen fresh. So these dried ones do have a real kick!!! Oh yes please – I´m very easily tempted! I LOVE the smell of toasting spices in the pan…Mmmmm…. Hello Beautiful Blogger Award Recipient. I hope my mention in Pink Coconuts and the Best Reality Show Ever brings some readers your way. Thanks for being among the best online reality shows ever! Tee hee. If you are so inclined, post 7 interesting things about you and nominate 15 blogs for the Beautiful Blogger Award. If not, no problem….it’s win win either way. I have never made curry powder, but have heard that fresh homemade is the only way to go. I love curries and mostly eat them out in restaurants, but maybe I will attempt a recipe soon using your curry powder recipe. Thanks for the inspiration. And here’s the link for the curry on my site…it’s actually different than the others I was just telling you about. But I use it all the time and love it. It has no turmeric, but you could always add. http://cooking-spree.com/2011/10/17/a-trip-to-morocco/. Wonderful curry powder recipe, Claire (& beautiful spice grinder)…the joy of homemade freshly roasted and ground spices can’t be beat!! And I’d make them fresh for every Indian meal, like my granny, if only I had the time to:) Thanks for the link to the spice article on our blog…you’ll be amazed at the range of curry masala blends-dry &wet from across India….add the complexities of Thai, Malay and Indonesian curry blends…and its a curry smorgasbord like none other! a pleasure to link back to you, I think your blog is fab! I love spice blends and make them a lot, especialy Thai or indonesian, so flavourful. I only use a “curry mix” for specific dishes, one of which I need to sort the photos and words for, but like you realise we can’t all be like your Granny and prepare them fresh each time, I wish I could though!! Awesome. I can almost smell the wonderful flavours. Ohhh, now that makes sense!! My adviser in graduate school always brought the best curry dishes to parties–he had done his fieldwork in India. Now I am wondering if he (or his wife) made the curry powder. I’ll bet that smells amazing when you roast it!